Ryparken Lille Skole (literally "Ryparken little school") is situated in a century-old former textile factory in Copenhagen. For years the school and its inhabitants suffered from the building’s decrepit conditions, until in the early 2010s, the school board decided to start a major renovation project. It would include replacement of the old single-pane skylights, with 85 fixed and 12 vented triple-pane VELUX Modular Skylights. The old textile factory-turned-school was showing considerable signs of age. The roof was leaking and energy consumption from heating the building had quite literally gone through the roof. Demolition was never an option as it would be too expensive, and in any case, these iconic buildings are listed for preservation. So instead, the school decided on a renovation project to modernize the building while improving the school's indoor climate with more daylight, fresh air and better temperature control. It didn't take long for the architects to look towards the sky in achieving the school's vision, as the iconic sawtooth roof with its dark-painted northlight glass was a perfect opportunity to fill two needs with one deed. In a seasonal climate like Denmark’s, securing a comfortable indoor climate can be tricky. Not enough windows and other venting options means temperatures can spike in the summer, while a lack of ventilation can mean elevated CO2 levels and poor indoor air quality all year round. Too many windows, on the other hand, and the building’s users may freeze in the cold winter months. That is, of course, unless the windows are properly insulated. This is one of the challenges for architects working in seasonal climates: how to ensure good indoor climate while providing adequate daylight throughout the year? A key component is to have proper, thermally insulated windows and skylights with double glazing as a minimum. By modern standards, the single-pane glass of the existing windows in Ryparken Lille Skole was a veritable thermal bridge, allowing heat to haemorrhage through the roof. With the highly effective thermal properties of their new triple-paned VELUX Modular Skylights, however, letting in plenty of daylight in winter no longer means plummeting temperatures and sky-high heating bills. Insulation is only part of the story. 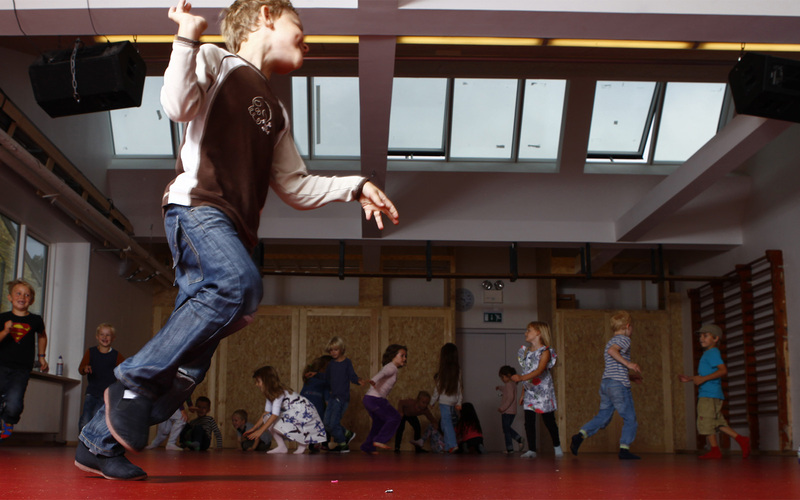 To help maintain good CO2 levels and pleasant summer temperatures you also need access to fresh air – particularly in a building like Ryparken Lille Skole, where facade windows are limited. To ensure effective ventilation of the classrooms, one key goal for the project was to create a large vented area. VELUX Modular Skylights provide the optimal ventilation solution, with 12 venting modules installed in the project. This allows for significant levels of ventilation, while increasing the comfort, health, wellbeing and performance of pupils. In fact, it’s possible to specify VELUX Modular Skylights with up to 50% venting modules, and all modules look identical when closed, so design is not compromised in any way. Furthermore, the vented modules can be set to work automatically. These automatic vented modules are particularly beneficial in a school like Ryparken Lille Skole, where classes and breaks run in fixed intervals. This means a ventilation schedule can be set up where the vented modules work together with CO2 sensors, automatically opening during the breaks if fresh air is needed. Automatic vented modules also ensure a healthier indoor climate, with less CO2, less particles in the air and better natural cooling in the warmer summer months. "We are extremely happy with the result. 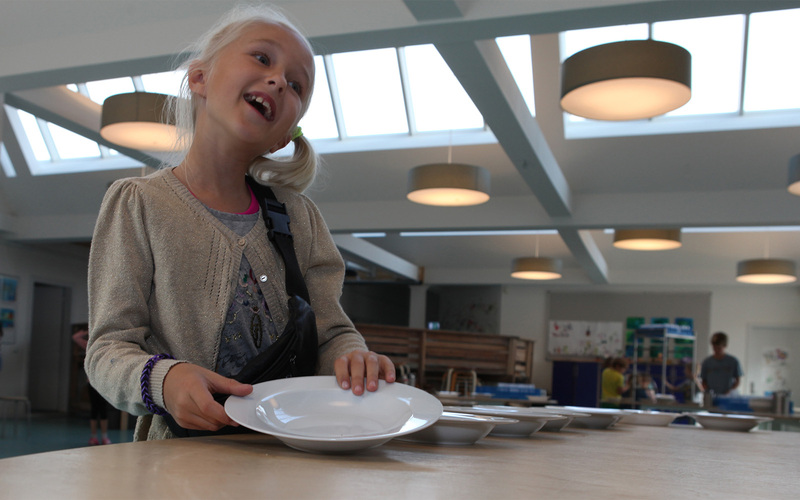 The school has become a much better work place with a better environment for everybody," says Mette Lisbjerg Jensen, headmaster of Ryparken Lille Skole. Studies have shown that poor indoor air quality reduces children's academic performance, while good air quality enhances performance in the classroom.